There Will Be a Total Lunar Eclipse of a Supermoon Tonight. Here's How to See It. Yes, sometimes it seems like astronomers are just playing Mad Libs with the moon. The Super Blood Wolf Moon, as the event is being called by many, sounds like a deleted chapter title in a Harry Potter book. You don't have to say it if you don't want. It's a lunar eclipse and supermoon combination that will arrive this weekend. You can just say a total lunar eclipse. You can see a total lunar eclipse at the same time as a supermoon the night of January 20 into January 21. The moon isn't going to turn you into a wolf or seep blood. It will, however, be large, beautiful, and hued red. A total lunar eclipse doesn't come along very often, and it's easy to see even under the bright lights of a city. So, it's absolutely worth the effort to get out and stare up at it for a while, but not because of blood magic or werewolves or other fantasy novel tropes. But simply because it's going to be a beautiful sight. When does the lunar eclipse start? Around 11:44pm EST the night of January 20, the moon will succumb to a reddish, coppery color, a product of the arrival of totality, the moment when the moon is fully eclipsed, according to Space.com. The midpoint will be at 12:12am EST on January 21 and will finish that part of the eclipse at 12:44am EST. The partial eclipse will begin at 10:34pm EST and will end at 1:51am. It will be the first total lunar eclipse to be visible in the United States in nearly three years. Totality takes place over a relatively short amount of time compared to the full length of the event. The eclipse will be visible across North and South America, as well as parts of western Europe and Africa. It should be easy to spot across the U.S., but you'll need clear skies to catch it. That's not going to be the case for many who are huddled inside through snowstorms. The January supermoon, which takes place when a new or full moon is within 90% of its closest approach to Earth, is the first of three in 2019. 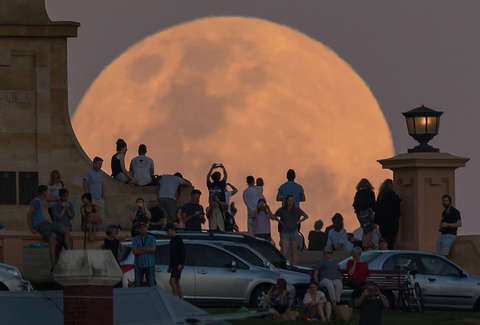 The supermoon trio arrives one after another during three consecutive full moons over the early part of the year. January's will be followed by supermoons on February 19 and March 21. The February supermoon will be the largest of the three, as the moon will be at its closest approach. On February 19, the moon will be just 221,734 miles from Earth, according to EarthSky. So, you know, it's practically in your backyard? A lunar eclipse occurs when the moon passes through Earth's shadow. Despite sitting in the shadow of our planet, sunlight still reaches to the moon after it passes through the Earth's atmosphere. That process filters out the sun's blue light, per NASA, turning the moon red. There are three types of lunar eclipses. The rarest of them is a total lunar eclipse, which is what will be visible on January 20-21. This takes place when the sun, Earth, and moon are in perfect alignment. The Earth is nestled between the moon and sun. When it's anything but perfectly aligned, you will see a partial eclipse or penumbral eclipse. Why is it called a Super Blood Wolf Moon? As alluded to above, it's a ridiculous name. It carries the "super" because there's a supermoon. Some people will refer to a total lunar eclipse as a blood moon because of the coppery color the moon adopts during totality, as explained above. You can just say eclipse. If you call an eclipse a blood moon it sounds like you're about to perform some dark magic ritual. That's even truer if you insert a "wolf" into your blood moon talk. A wolf moon is often the name for the first full moon in January, according to some sources, but it doesn't really explain anything and it doesn't need to be called a wolf moon. The "wolf" does not add anything special to this eclipse. It just makes it sound a little bit fancier. And, to be fair, it's not a label you're likely to hear many astronomers saying with frequency. There are five eclipses taking place in 2019, two of which are lunar eclipses. However, this is the last total lunar eclipse visible in the United States until May 26, 2021. If you're looking for your next chance, we have a full list of every eclipse that will take place over the next 10 years. If the weather isn't cooperating near you, obstructing your view of the sky, you can stream the eclipse at Slooh.com with the broadcast starting at 10:30pm ET. The Weather.com mobile app will also be streaming the eclipse starting at 10:45pm ET.